Quinton Crocker sporting a mighty fine beard, along with a newsboy cap and some spiffy suspenders. The beard has always been a visually prominent sexual trait of maleness, though facial hair fashions have changed throughout history, as fashions always do. In the early 21st century there has been a resurgence of interest in facial hair as a form of creative adornment, to a degree not seen since the mid 19th century. Part of this phenomenon has been the emergence of Beard and Moustache Competitions. A governing body, the World Beard and Moustache Association, was established in 2004 and sets the standards for competitive categories and judging criteria. These competitions tend to be raucous affairs, usually held in a bar, with the proceeds being donated to a local charity. A community of beard enthusiasts has emerged around these events, so the entrants at one competition may well be the judges at the next. Some dress up as rather dapper dandies, others dress down in work shirts, biker jackets and bandanas. They all take their beards very, very seriously. We photograph these competitors shooting Tintypes, a variety of the Wet Collodion process, which was invented in 1851. We take full advantage of the irony that this historical photographic method was prominent during the last great period of elaborate facial hair. The historical tintype/facial hair connection is far from accidental. In 1855-56, photographer Roger Fenton traveled to Crimea to document the British soldiers engaged in war with Russia. 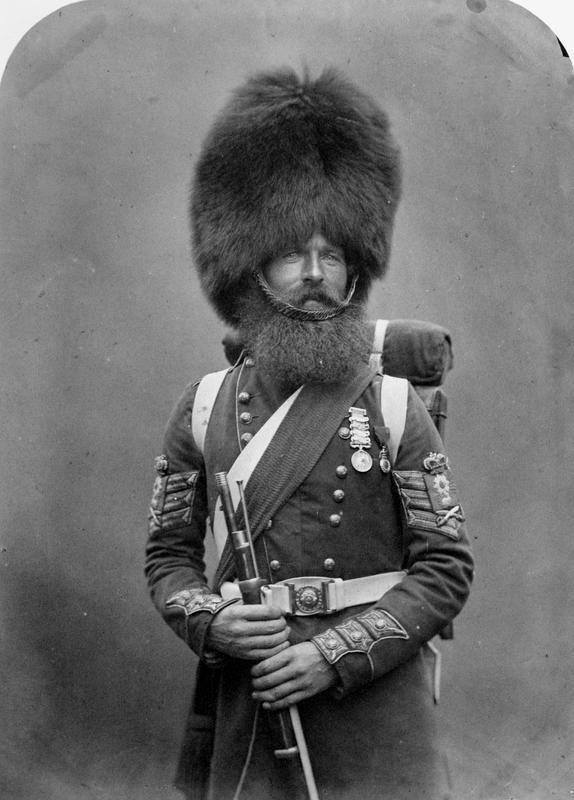 The British Army had problems supplying proper winter gear, so they relaxed the regulations on beard length, as a way to combat the cold. The photographs made by Fenton (using the same process Project Barbatype does) were reproduced in London newspapers, and it became fashionable for British upper-class men to grow long beards, in a show of solidarity with the soldiers. General Ambrose Burnside, whose inspired form of facial adornment is the origin of the term "sideburns"
In the time of the Civil War, a beard that required extensive maintenance was seen as a sign of status and manliness, a marker of the daily personal discipline of the wearer. We think the men (and women!) who compete in these contests are marking out and creating a new kind of masculinity, one that recognizes the absurdity and subjective nature of the ways gender has always been performed. These men exaggerate the appearance of their facial hair to parody themselves while indulging their desire to signal an inflated virility. They can both participate in, and undermine, the ridiculousness of it all. This video is of a panel discussion on the "History, Benefits and Social Significance of Facial Hair," hosted during the BeardCon convention and beard contest in Columbus OH, October 2012. The talk features Dr Christopher Goldstone-Moore, Dr. Paul Roof, and John D. Buckler of the Buckeye Bearders.